An email will be sent to registrants prior to the first session with specific instructions and information. This program is for children who are 3 and 5 years old. It is a unique opportunity to introduce your child to soccer. This program is designed to enhance your child's mental, physical, and social abilities through creative soccer games and other activities. 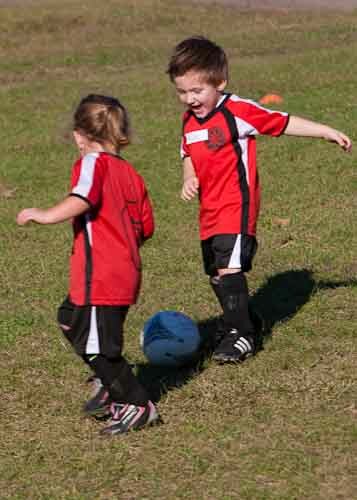 Your child will develop a sense of teamwork while learning the basic skills of soccer. And most importantly we have lots of fun! At this level it is not so much about competition and the game. Its about getting kids to listen to and play well with others, follow instructions and giving them the confidence to leave their parents and join the other kids on the field. Being a team member is emphasized. They do some goal scoring activities and occasionally will play 1 v 1 but mostly they will play fun games. They will learn how to navigate an obstacle course which will teach agility and coordination. These activities are designed to instill and build self confidence and independence. They will do agility skills training with and without the soccer ball. The biggest emphasis is on having a good, rewarding experience. We start them at a young age to enhance early skill development and to help them be better soccer players for when they get a bit older. All players need to wear shin guards for safety. Soccer shoes (cleats) are highly recommended because they give better traction but tennis shoes are acceptable for the U4's only. Individual owned soccer ball (size 3) is required. You will need to bring water or juice to every session to maintain adequate hydration. As well as anywhere else you can buy sports equipment!